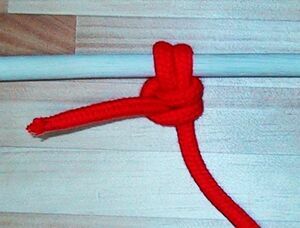 The Anchor Bend is a knot used for attaching a rope to a ring or similar termination. Its name originates from the time when "bend" was understood to mean "tie to", and not restricted to knots that join rope ends. While the knot can become jammed in some modern materials, it is usually easily untied after moderate loads; it can be made more resistant to jamming by taking an extra turn around the object--this will make for a 1-diameter longer span of the end to reach around the standing part to be tucked (although in a case of tying to a small shackle or link of a chain, this might not be possible). It is the accepted knot for attaching anchors (or more usually anchor chains) to warps. 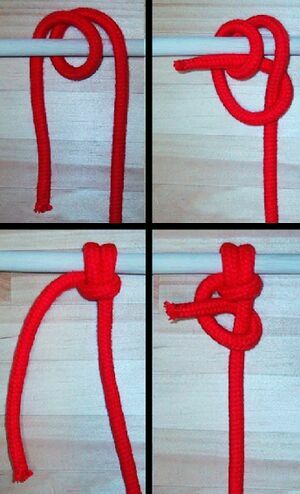 The knot is very similar to a round turn and two half hitches except that the first half hitch is passed under the turn. In many everyday uses, the finishing half-hitch need not be made; alternatively, one might seek surer security by tying off the end with a Strangle knot to the standing part.